Kitchen electrics are often over looked when installing a new kitchen, kitchens receive more wear and tear than any other room in your house, so when installing a new kitchen it’s important to have the kitchen electrics checked to see if they need to be rewired. The electrics in your kitchen where designed for the previous kitchen and may not take any additional load that you may be putting onto it. So it's important to take this into consideration when planning that new kitchen installation that you might need to have your kitchen rewired. You might not need to have your electrics in you kitchen rewiring you may just want to move a few sockets or just add a double socket in the kitchen area, or add sockets for the new appliances. You may be thinking what does a kitchen rewire cost, or whats the price for a kitchen rewire, click here to find out. If you have had an electrician tell you that you need to upgrade your earthing or there is no earthing and it needs to be installed before he can install any electrics in your kitchen, click here to see what he is talking about. Kitchen lighting is as important as the lighting in your lounge or bedroom. It helps with mood and comfort in the kitchen – but there are also practical considerations. While you may eat at a dining table in the kitchen, for the most part you’ll be working – preparing meals, washing up, maybe even a spot of laundry. Kitchen lighting that’s effective in helping you work is key to making your time in the kitchen more enjoyable. • Which parts are you likely to end up using most? • Take into consideration your kitchen area dimensions – exactly how tall is the ceiling? • Where are your doorways situated? • Is there enough space for lighting effects on your kitchen worktops? Knowing exactly how these problems correspond with your kitchen will help you figure out exactly what lighting style you need as well as knowing where the lighting can go. What type of lighting styles accommodates large and small kitchens? If your kitchen is small, it shouldn’t usually require a wide range of lighting points. Often a good number of recessed lights or perhaps a large centre light will be sufficient, as they provide great illumination throughout the whole kitchen area. You may want to have a look at under cabinet lighting for the places around the worktop. For larger kitchens, a single light generally won’t be adequate. Think about a mixture of standard lighting, particular lighting effects for worktops, as well as lighting effects to focus on unique areas of your kitchen. These days contemporary spots or down lights are available in a huge number of various types, styles or colours and deliver a significantly better light. Furthermore considering the location where the lights should go can give a lot more direct light displaying locations where you require a lot of light together with taking light away from parts which don’t require almost any. Most contemporary lights will take lamps that are able to have differing angles of light from a spot giving you exact light location you would like it. ￼￼Having lights under your wall cabinets will transform the look of your kitchen, pelmit lights as we call them come in a wide range of styles to suit your requirements. The significance of high-quality lighting in a kitchen is generally over looked. These days a kitchen is not only a cooking place where you can produce a meals, it is a lot more likely to end up a meeting area, or a hang out, and yes a location to enjoy a meal. Each one of these areas might benefit from a different type of lighting. The positioning of kitchen appliances is one of the first tasks when designing a kitchen. Because of this, the position of the power supply will be decided for you. Appliances for the kitchen like washing machines, refrigerators and dishwashers etc can be plugged into a normal socket. 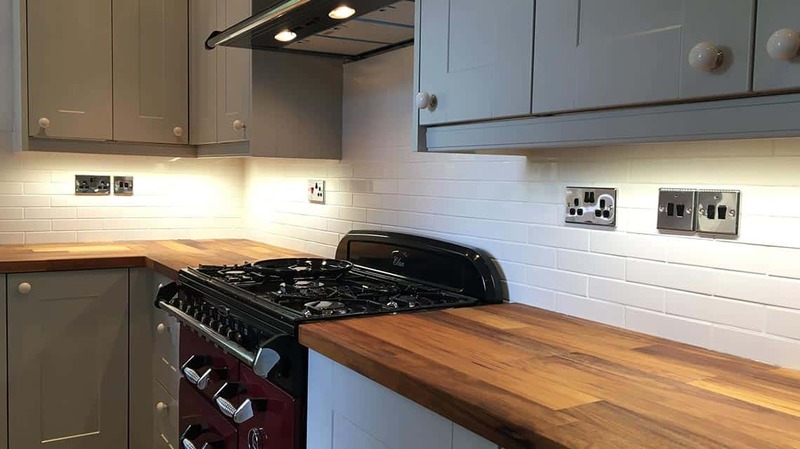 However, specifically if you have young children, it may be better to have the electrical sockets concealed beneath the worktop areas or behind cabinets and provide individual switches to isolate them at a higher level. Safety aside, this also eliminates your children accidentally switching the fridge freezer off. The installation of or fitting an electric powered cooker should be done on its own circuit. An electric powered cooker should not be spurred from any other circuit and should be controlled by its own fuse within the consumer unit. Because of this, if it is a new installation it counts as installing a new circuit and it is not allowed by any other than a Part P certified electrician. Electric powered cookers pull huge amounts of current due to the heat they produce therefore a greater fuse is needed as well as a thicker cable as well as a double pole isolator switch. Normally when a switch is fitted it interrupts the live cable of the circuit. The actual switch breaks the connection within the live wire. An Isolator is a heavy-duty double pole switch disconnecting the live and also the neutral is broken therefore there is no fear of any kind of residual current causing a shock once the switch is off. The incoming mains is normally wired directly into the isolator switch that preferably would be positioned to one side of the cooker. (to ensure you don’t have to lean over the cooker to turn off and on). The cooker needs to have a separate 30amp circuit breaker on the consumer unit or fuse box, Cookers should not be plugged in with an ordinary plug and socket they should be hard-wired into a wall plate with a separate switch to isolate the supply when necessary. A good extractor hood contains three main components: a skirt or capture panel to retain the rising gases, one or more grease filter systems, along with a fan. There are 2 important applications of extractor hoods: ducted or vented, and ductless or recirculating. In a ducted Extractor Hood, the output collar of the extractor hood’s blower electric motor is connected to a duct system, which terminates outside the property. In a ductless Extractor Hood, a filter containing activated charcoal is required to eradicate odour and smoke particles from the air, prior to delivering the cleaned air back into the kitchen. A ducted Extractor Hood is usually more suitable, mainly because it enables eliminating all types of air-borne contaminants, while ductless Extractor Hoods recirculates moisture and heat into the kitchen environment. Extractor Hoods more often than not include a built-in lighting style incandescent, fluorescent, to light up the cooking area. Additionally, some manufacturers provide matching accessories, for example: splashback panels, pot racks, display units, dish racks, allowing a greater flexibility of design.